Detailing the physical features, habits, territorial reach and other identifying qualities of the Twinflagged Jumping Spider. Two white spots on the pedipalps of the Twinflagged Jumping Spider look like white flags of surrender when it waves them in circles. 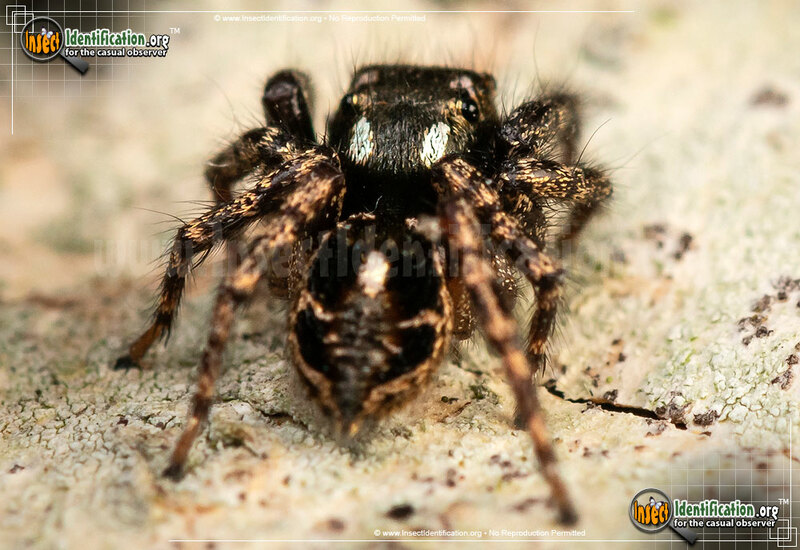 The small Twinflagged Jumping Spider is mostly black with two or four white marks on its cephalothorax (head plate). There are some variations among the species, but a few features are consistent between them. Though the abdomen may be smaller in some individuals, it comes to a point at the tip, and has a white dash right in the center. A white ring encircles this dash and some lighter colored chevrons may break it as they stretch from the dash to the end of the body. Legs are lighter-colored with dark bands. The remarkable feature that gives this spider its name is found on its pedipalps. Though they look like a 5th pair of legs in by the face, they are not. These appendages are not for walking. Instead, they are used to help sense the environment. A joint on each dark pedipalp has a bright white spot. This spider curls the pedipalps under and moves them in small circles, as if it is waving those little white spots like flags or handkerchiefs. 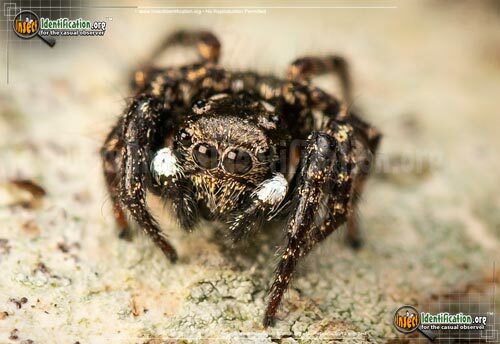 Like all other spiders in the Salticidae family, the Twinflagged Jumping Spider pounces on insect prey. It does not create a web for catching food. It is almost always on the move and can be seen on the forest floor, leaf litter, rocks, leaves or stems of plants and even man-made items like cables and decks. Sometimes it may wander inside while searching for a meal, but it is not troublesome or dangerous to people. Its tremendous leaping ability also helps the spider escape from threats, or people who are too close. Small, but fast, the Twinflagged Jumping Spider is a fun spider to watch.